From the moment the strum of the guitar started playing, and the flashbacks of Charlie’s life and death began during her hunter’s funeral, I knew this episode was going to be a roller-coaster of emotions that would have us all reaching for the tissues and hanging off the very edge of our seats until the credits rolled by. And boy, I couldn’t have been more right if I tried. 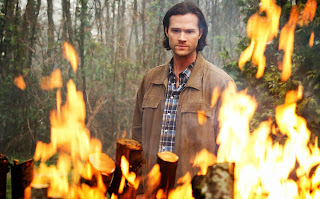 In Dean’s eyes, Sam is to blame for Charlie’s death. He’s not entirely wrong in a small way -- Charlie was dragged into helping Sam behind Dean’s back, and that, of course, led to her death. Now, this isn’t the first time that one of the brothers have said something hurtful they didn’t mean, something that they couldn’t take back -- please, this show is based on that. But it’s the way that he says it that has all of us dropping our jaws in shock, or, for some people, going into full-fledged hate mode toward the eldest Winchester (myself NOT included). The way he treats Sam is cold, practically arctic in temperature. But for me, this isn’t our Dean anymore, not entirely. While Dean has always had a temper, and, yes, sometimes is quick to hold grudges, we cannot conveniently forget about the Mark of Cain which is slowly turning him into an angry, blood-thirsty monster. Now, I don’t know about all the potential angry, blood-thirsty monsters you’ve encountered, but I think it’s safe to say they aren’t rainbows, sunshine, and puppies when upset. All the real grief and anger Dean feels about Charlie’s death coupled with realizing his brother has gone behind his back, yet again, is multiplied and made so much worse by the Mark on his arm. Sam, despite this, still isn’t giving up, even after being told to drop it completely. Dean has spent his entire life watching after his little brother and sacrificing everything to make sure he was the one who lived. This time around, it’s Sam’s turn. Charlie cracked the code, and now Rowena can translate the book. 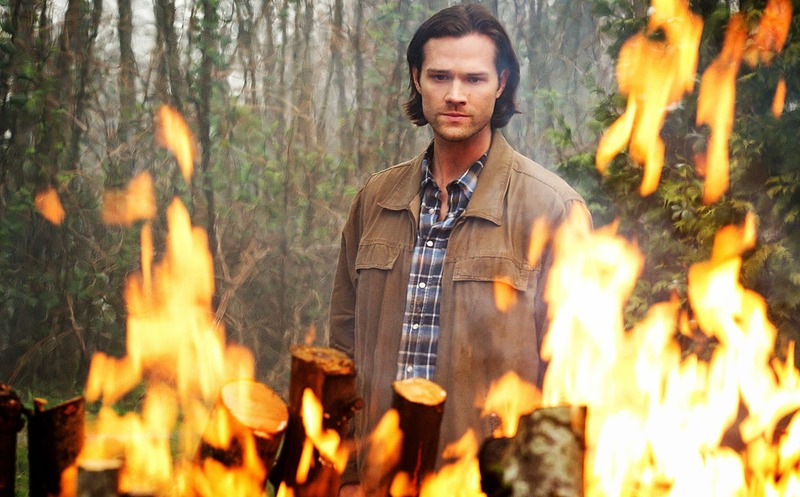 Sam can do this, he can save Dean -- or at least, that’s what he believes. But first, he has to kill Crowley in order for Rowena to hold up her end of the deal. Any normal person would be rooting for him to succeed. I’m sure there are many people out there who are ready for the King of Hell to finally kick the bucket, but I’m not one of those people, not really. There’s something about this show that makes me love the bad guys just as much as I do the good guys. Crowley is literally the KING of HELL, and is responsible for so much death and chaos, even responsible for everything that is happening right now, and even so, I don’t think I’ll ever be quite ready to watch him go. Meanwhile, Dean finds himself under arrest, thanks to the Stynes being friends of the local law enforcement. It doesn’t take long for him to make his escape and leave a trail of dead Stynes all the way through their household and back to the bunker, arriving there moments before they are about to torch the place. He exacts his revenge on the man responsible for Charlie’s death with a quick bullet to the head, and then kills the young cousin, Cyrus. I can’t even begin to express how bad I feel about Cy; for a moment, I really thought Dean might spare him, but it just goes to show how far off the deep end Dean is going. If all this wasn’t enough to have me freaking out, I definitely was after the final scene, when Dean nearly kills Cas. When he brought the angel blade down, I stopped breathing. I’m not kidding -- I literally stopped breathing and stared at my television not sure if I should start crying yet. Though, with the lack of bright angel-y grace upon impact, I quickly, with ridiculously immense relief, realized he had spared him. The whole interaction reminded me of back when Castiel had been going off the dark side himself, when he beat Dean into a bloody pulp, nearly killing him as well. So, who wants to volunteer to call 911 for me next Wednesday? “I’d be happy to kill her. She just called me a fish.” You may be a fish, Cas, but you’re our fish. “They’re practically gods around here.” “Yeah. Well I kill gods.” This is more terrifying than funny because it’s actually true. “I don’t want to have to hurt you.” “I don’t think that’s gonna be a problem.” CHILLS.